THE text incorporated in the MoU on the repatriation of the Rohingya refugees (it has also been called an ‘arrangement’ and ‘instrument’) that the government of Bangladesh had signed with the government of Myanmar during the visit of the Bangladesh foreign minister to Myanmar in the end of November is now emerging slowly but disappointingly for Bangladesh. Some of it came from the seminar held in the past week by the Centre for Policy Dialogue on the costs and the time frame for the repatriation of the Rohingyas. The CPD estimated that the repatriation would be completed in seven years and cost $5.9 billion andm that too, if the repatriation process was to be smooth. The CPD seminar also highlighted other significant costs of the Rohingya crisis for Bangladesh, social and environmental. The CDP seminar did not focus on the security dangers that could be expected if the process of repatriation was to take that long. And since the MoU was signed, an additional 50,000 Rohingyas have fled to Bangladesh. To add to the pessimistic scenario, NGOs working with the Rohingya refugees have stated that 50,000 to 70,000 Rohingya women are already pregnant in the refugee camps. These women are illiterate and unaware of family planning measures. 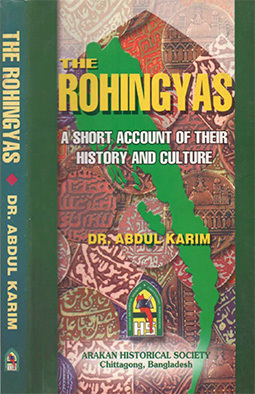 Their husbands are also illiterate and do not believe in family planning.Former Indian high commissioner to Bangladesh and an expert on the region on security and foreign policy related matters Pinak Ranjan Chatterjee saw the picture of the Rohingya repatriation more clearly and even more ominously than the CDP. He saw little prospect of most of the Rohingyas ever returning. He, therefore, suggested in an article tiled ‘The Most Unwanted People’ that he wrote for the Telegraph on December 27 that the Bangladesh government should plan for settling them in the country and to talk with friendly governments that would be willing to take some of them. The Bangladesh government itself did not see much hope in the MoU. It, therefore, requested the UN early this month to step in and assist the repatriation process. That request, of course, would not have much impact because two of the permanent members of the United Nations, China and Russia, have said that the Rohingyas were no concern of the United Nations and whether Myanmar would take them would depend on Myanmar alone that has shown little intention to do so apart from signing the MoU that it knows would do little in repatriating the Rohingyas in any large number. The MoU has been brokered by the Chinese foreign minister Wang Yi after visiting Bangladesh and Myanmar and importantly after China had supported the Myanmar government at the United Nations. The Chinese foreign minister suggested a three-stage repatriation process leading to the final resolution of the Rohingya problem. In the first stage, China wanted an immediate ceasefire by the Myanmar military. In the second stage, China expected Bangladesh and Myanmar to find a workable solution for the repatriation of the refugees. Finally, China wanted in the last and final stage that the Myanmar government should undertake poverty alleviation measures for the Rohingyas to discourage them from leaving the country. The fact that 50,000 Rohingyas had fled the Rakhine state since the MoU was signed suggested that even if the Myanmar military had ceased its military operations against the Rohingyas, the reality on the ground is still dangerous underlining the fact that China’s three-stage plan is still stuck in the first stage. Meanwhile, the Rohingya refugees in the camps in Bangladesh have indicated quite clearly that they are not willing to return to their homes because they fear for their lives. Therefore, the three stages resolution of the Rohingya tragedy that China thought it had brokered shows no signs of going anywhere. Notwithstanding the above, the Bangladesh ministry of foreign affairs has taken a number of initiatives to project that it is on the right track on the Rohingya problem. On its behalf, the BIISS has held seminars to explain the case from Bangladesh’s perspective. In these seminars, the BNP has also been blamed for the Rohingya crisis that has underlined that the ministry itself is uncertain that the MoU would help Bangladesh resolve a grave national problem. As things stand at present, Bangladesh would be forced to spend a sum of money that would be more than enough to build a second Padma Bridge or another mega infrastructure of its magnitude for the country. It is a pity that the ministry of foreign affairs did not see that it had wasted in dealing with the most serious problem that Bangladesh faced since its liberation in the area of foreign relations after the prime minister showed it the way. She had done something for the Rohingyas like Mrs Gandhi had done for the Bangladeshi refugees in 1971. She had successfully stirred the world’s attention to the fact that the Myanmar military was committing genocide/ethnic cleansing on the Rohingyas as Indira Gandhi had with the actions of the Pakistani military. The United Nations and the western nations agreed with her assessment and had shown the willingness to put Myanmar on the dock. The Chinese-brokered MOU, instead of following upon the work of the prime minister, did not do justice to her outstanding diplomatic work. In fact, thanks to the MoU, Myanmar is no longer on the dock and Bangladesh would remain stuck with the one million refugees for the next seven years at huge financial, social and environmental costs and that too, according to the CPD, if the MoU detailed repatriation process would proceed smoothly! 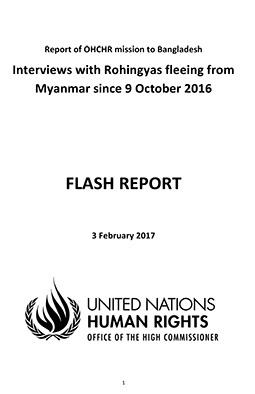 In fact, no one knows for sure what has really been incorporated in the MoU to be able to tell what would be a smooth process and little that has become public about the text of the MoU suggests that it has been written the way the Myanmar side wanted it where even the word Rohingya has not been used because Myanmar does not accept the Rohingyas as an ethnic group of the country. 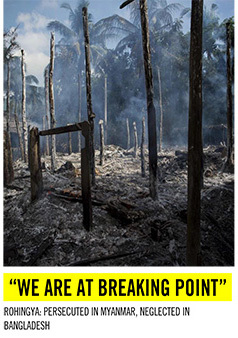 Bangladesh by opening its doors to the victims of genocide has shown its compassion for humanity while the Myanmar military has been the perpetrators of the crimes against humanity. Yet, all of Bangladesh’s neighbours and friends outside the western and Islamic countries took the side of the perpetrators of the genocide/ethnic cleansing. India took the lead, followed by China and Russia. Even Bhutan, Nepal and Sri Lanka voted at the United Nations against Bangladesh and for Myanmar. And at the 31st ASEAN Summit, the biggest man-made tragedy of recent memory, namely the Rohingya tragedy, was not even discussed although Bangladesh has a resident mission in almost all the ASEAN countries and the Rohingya crisis occurred in the backyard of ASEAN. Even the CPD’s ominous assessment on the repatriation of the Rohingyas appears uncertain. Instead, former Indian high commissioner Pinak Chakravarty’s assessment that ‘Myanmar is unlikely to take back most of the refugees and Bangladesh will have to resettle them in new refugee camps and hope other countries will ease the burden by accepting some refugees’ seems to be the more likely outcome of the ongoing Rohingya crisis. Thus Myanmar that had made no secret that it would not have any Rohingyas in its country eventually is going ahead and implementing its long-laid-out plan and Bangladesh’s closest friends are on Myanmar’s side. Therefore, the foreign ministry should reassess the friends of Bangladesh as well as its own disappointing role in carrying forward the diplomatic initiatives of the prime minister. It is unbelievable that while Myanmar was on the hooks, not one special envoy was sent to the capitals of the friendly countries that went against Bangladesh. And the ministry and the BIISS while assessing why the friends of Bangladesh did not stand by its side together with the silence of ASEAN in such a major crisis should also look seriously at the strategic shift in the balance of power that the Rohingya crisis is bringing to the region. Myanmar is easing out considerably Bangladesh’s strategic importance that it has to offer to countries such as China, Japan and also India. M Serajul Islam is a former career ambassador.